Gore Hill Park in St Leonards has been redeveloped to create a multi-use sports ground in the northern Sydney suburb. 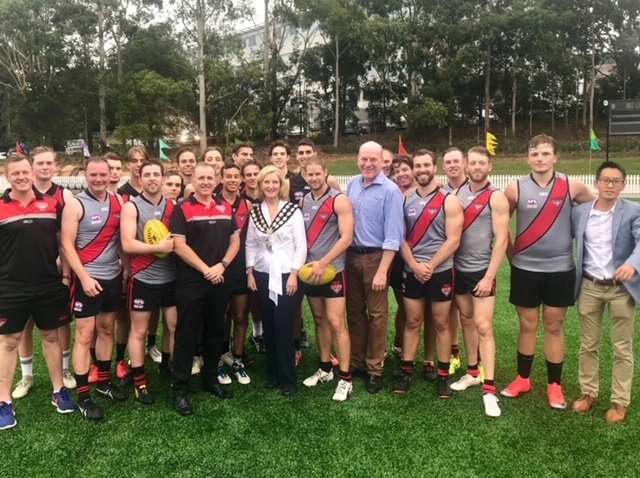 Federal Member for North Sydney Trent Zimmerman, who attended today’s opening event, said the project has transformed the much-loved park into a high-quality facility catering for numerous sports. “The oval now has an all-weather synthetic surface and with a new stormwater retention system the oval can be used in all weather, without any rest days required to keep the field playable,” Mr Zimmerman said. Deputy Prime Minister and Minister for Infrastructure, Transport and Regional Development Michael McCormack said the Federal Liberal and Nationals Government’s $9.5 million investment in the project was instrumental in the transformation of Gore Hill. “When up to 3,000 people each week make use of a facility such as this, the benefits of investing in upgrades are widespread – now residents, sports clubs, local TAFE students and fitness trainers alike will have access to a superior quality oval,” Mr McCormack said. Willoughby Mayor Gail Giles-Gidney said she is thrilled the project came in on budget. “The overhaul means versatility. The new offerings such as the playground, perimeter path, outdoor gym, half-basketball court and handball courts ensure more people can use the space more often,” Cr Giles-Gidney said. This project was jointly funded with the Federal Liberal and Nationals Government investing $9.5 million and Willoughby City Council $1 million.